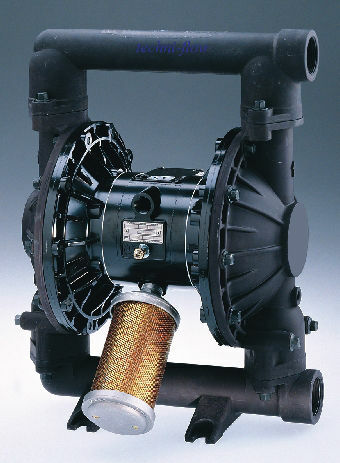 The range of air operated diaphragm pumps Techni-flow metal TFX400 is available in many materials including aluminum, cast iron and stainless steel, this variety allows the range of pneumatic diaphragm pumps Techni-flow adapt to a large number of transferred ink applications in the printing of cardboard, pumping solvents ATEX zone, pumping paintings. drain tank bottom petroleum products. etc. TFG400 the pump is the smallest of the big pumps, this pump range the advantage of being easily transportable by one person, in case your application requires more flow the Techni-flow range also features pneumatic pumps TFG800 2 " or more of the pneumatic pump tfg1500 membranes for applications requiring even greater speed or if the fluid to be pumped is more abrasive. For less intensive applications or for applications where the size of the pump to its importance, the range of pneumatic diaphragm pump with a flow TFG200 189l/mn successfully complete applications or lightness and portability are paramount, by example in applications bilge pumping ship or passageway is hard to focus . The range of small pumps is represented by the series of pneumatic diaphragm pump TFG100 connection with 3/4 " and maximum flow of water on 60l/mn .